Speech pathologists, officially called speech-language pathologists and sometimes called speech therapists, work with people who have a variety of disorders that include the inability to produce certain sounds, speech rhythm and fluency problems, and difficulties with their voices. They also help people who want to modify accents or who have swallowing impairments. Speech pathologists' work involves assessment, diagnosis, treatment, and prevention of speech-related disorders. In 2017, median annual earnings for the field were $76,610, the most recent figures as of January 2019. 145,000 worked in this occupation in 2016, the most recent figures as of January 2019. Most of these jobs were in educational settings. 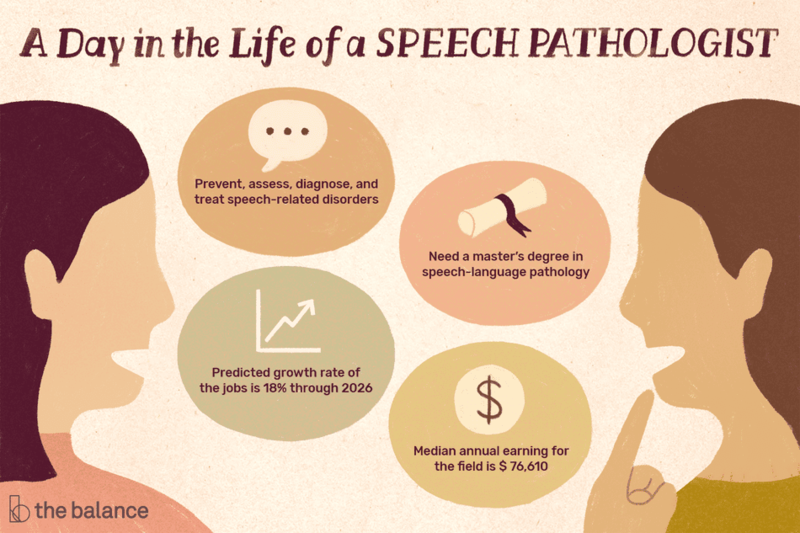 Other speech pathologists worked in hospitals, offices of other health practitioners, and nursing care facilities. Jobs are typically full time, with only about a quarter of them being part-time positions. The predicted growth rate of speech pathology jobs is 18 percent through 2026, which is much faster than the 7-percent predicted average growth rate of all occupations. "Perform comprehensive patient evaluations, set appropriate patient goals, develop effective management/treatment plans and adhere to patient care and documentation timelines and guidelines"
"Identify patient short/long term goals in terms of functional outcomes"
"Attend IEP meetings and provide appropriate goals for students that require speech/language therapy"
"Maintain records of all services"
"Provide follow-up contact and referral as needed"
"Attend and actively participate in staff meetings, staff development, departmental committees, and in-service education programs"
"Provide continued rehab via legibly written home programs"
Regardless of where in the United States you want to work, it is likely you'll need to earn a master's degree in speech-language pathology. In addition to coursework in anatomy, physiology, the nature of disorders, and the principles of acoustics, you'll also receive supervised clinical training. Your undergraduate degree does not have to be in speech pathology, but you will have to complete prerequisites before you begin your graduate education. When choosing a program, you would be wise to pick one that the American Speech-Language-Hearing Association's (ASHA) Council on Academic Accreditation (CAA) has accredited. Many states stipulate that licensees have a degree from a CAA-accredited program, and it's needed for certification as well. In most states, speech pathologists must be licensed, but the requirements vary. To learn more about licensure in the state in which you plan to practice, see the American Speech-Language-Hearing Association's (ASHA) State-by-State list. ASHA offers the Certificate of Clinical Competence in Speech-Language Pathology (CCC-SLP). While this is voluntary certification, it is important to note that some employers require it. In addition, according to ASHA, some states and school districts offer pay supplements to those who have it. While your formal training will provide you with technical skills, you will also need certain soft skills—or personal qualities—to succeed in this field. Compassion: As with many jobs in the health care field, it is essential that you are concerned about your clients' well-being and can offer them emotional support. Patience: The people under your care may not respond to treatment as quickly as you would like. You will need to have patience until they meet the goals you have set. Listening and Speaking Skills: You must be able to clearly communicate with your patients and other members of the therapy team in order to deliver the most effective treatment. Critical Thinking: When deciding on a treatment plan, you'll have to evaluate the available options before choosing the best one. Attention to Detail: This skill will allow you to carefully document your patients' progress. "The ability to establish/maintain good rapport with patients, customers and departmental staff"
"Must be able to work in a stressful environment and take appropriate action"
"Demonstrate tact and understanding when dealing with others"
"Must possess the ability to apply principles of logic and strategic thinking to a wide range of problems, and to deal with a variety of abstract and concrete variables"
"Able to recognize complications and adverse reactions to therapy and respond appropriately in determining proper treatment solutions"